Properties are found all over Access; also in Queries. This allows us to increase the control on their functions. 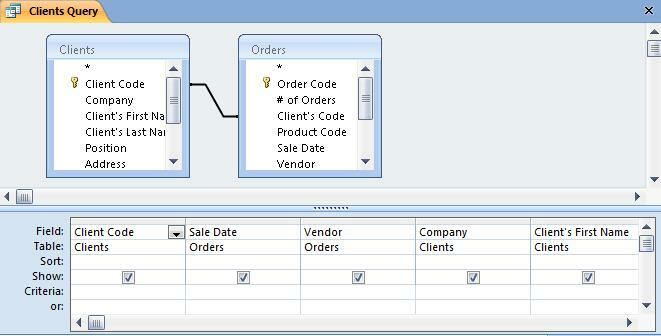 To be able to see the properties on a Query, we need to open the Query in Design View. 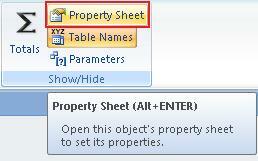 Then, click on the "Property Sheet" icon. In other versions of Access, place the cursor over the Title of the Query, we click on the left button of our mouse. This opens up a menu. Make sure no field is selected. Otherwise, it will only show the properties of that selected field instead of the Query itself. And these are the Query "properties". We will only see the most important properties. If you want information on the rest of them, you can click on F1 (if Help is available) after placing the cursor on the property which interests you. Description: Here, we can describe the Query. This is of great help when dealing with several Queries, or if it has been some time since we last used it. Output All Fields: By selecting "Yes", it will show ALL the fields in the design grid, even if they were not selected in "show". 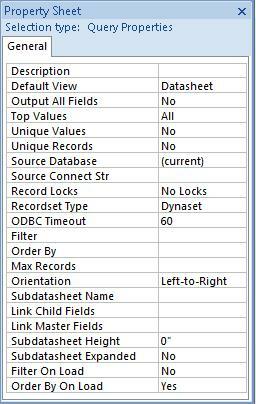 Top Values: It is very useful when we have Tables with multiple Records. If we indicate 5, only 5 records in the first Number field with the highest values will appear in the design grid. Unique Values: If we select "Yes", it will only show those values which are unique in the fields. Unique Records: Access will show values without duplicates. Even if at first glance these options don't seem so useful, they are helpful in the every day use of Queries.